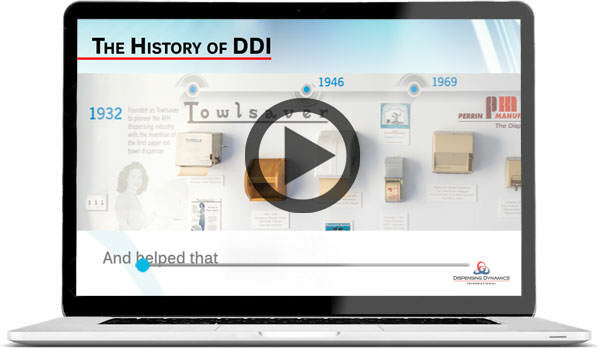 1932 Founded as Towlsaver to pioneer the AFH dispensing industry with Jack Perrin’s invention of the first paper roll towel dispenser. 1981 Towlsaver was sold to Crown Zellerbach and the manufacturing operations spun off as Perrin Manufacturing Company. 2007 Acquired by Kinderhook Industries, bringing a professional cleaning industry management team and the resources and charter, to become the worldwide dispensing leader. 2009 Acquired Global Plastics for a broader range of dispensing technologies, key management talent, new markets, and international OEM customer base. 2010 The combined enterprise was rebranded as Dispensing Dynamics International to symbolize new vision, strategy, resources, and industry leadership. 2012Acquired San Jamar for diversification beyond AFH washrooms into foodservice, healthcare, and janitorial distribution, and adjacent dispensing categories. In January 2017, DDI divested its San Jamar division in order to better focus on supporting its core business of global manufacturing for its OEM customers. 2017Hunter Industries acquires Dispensing Dynamics International, now transformed into Dispensing Dynamics launching an exciting new chapter in the future of both companies.